I think that is what they are playing. 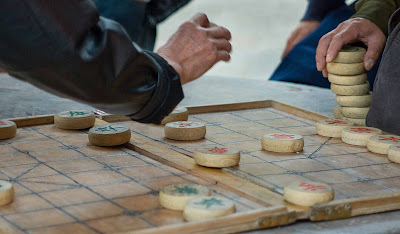 I couldn't establish at the scene what the game was, but the pieces do look like those used in Chinese Chess. Does anybody know for certain? Captured them in Soho (London's Chinatown). Both concentrating intensely on the game and not going to be bothered by those watching (or asking questions). Very interesting. I think I have never seen that game before. You're correct, it is Chinese Chess. I like the round edged pieces. I've never heard of Chinese Chess before but the playing pieces are interesting! They look like Christmas Cookies! This is a really good photo. It does look like they are playing with biscuits! I like they way you chose the angle and the moment for this photo, Mo. The intensity the players involved in the game is well represented by those hands and the motion. I also like the post bofore yesterday (of that child trying too peep through the telescope). Very candid and telling. I do believe it is Chinese Chess. I saw some men playing it in Chinatown in Boston a couple of weeks ago, and a friend I was with told me it was Chinese Chess. Unless he's wrong, I think you were right! Very well-composed shot, by the way. I like it.